This is a cool and refreshing balm that relieves stress and headaches. The recipe uses peppermint essential oil, two other essential oils, beeswax, and other ingredients. It’s a very easy balm to make. To use this balm, you take a small amount and massage it into your temples. Nice recipe. Please note: This balm shouldn’t be used if you’re pregnant. It’s also not recommended for babies or small children. 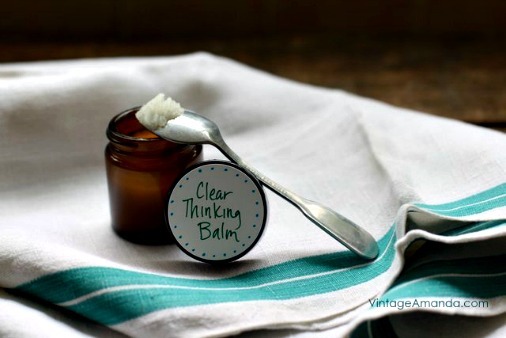 Click on the How to Make a Clear Thinking Balm for Stress and Headaches link below to see the recipe.